Located in Huayin, Shaanxi, Huashan Mountain is situated 120 kilometers east of Xi’an. With a vast area, Huashan Scenic Area is composed of the main peaks scenic area, Xiyue Temple scenic area, Xianyu scenic area, etc. The main peaks scenic area is the core scenic area, including the mountaineering trail at Huashanyu and the South Peak, the East Peak, the North Peak, the West Peak and the Middle Peak. Who visits: Photographers, Nature Lovers, Adventure enthusiasts! Huashan runs 15 kilometers from the the west to the east and 10 kilometers from the south to the north. It offers more than 200 scenic spots to explore. East Peak is 2,096.2 meters above sea level and is named after the location. There is a platform at the top of the peak, ideal for enjoying the sunrise. With a lotus-petal-shaped stone at the top of the peak, West Peak is 2,082.6 meters above sea level. It offers visitors Cuiyun Palace, Lotus Cave, Juling Foot, inscriptions on the cliff and other scenic spots to explore. With a height of 2,154.9 meters, South Peak is the tallest in the five main peaks. The steep and erect cliff is on the southern side of the peak. It offers visitors Baidi Temple, Eight Diagrams Pond, Southern Heavenly Gate, Chaoyuan Cave, Quanzhen Rock, Changkong Zhandao (Vast Sky Plank Walk), Yanggong Pavilion, etc. 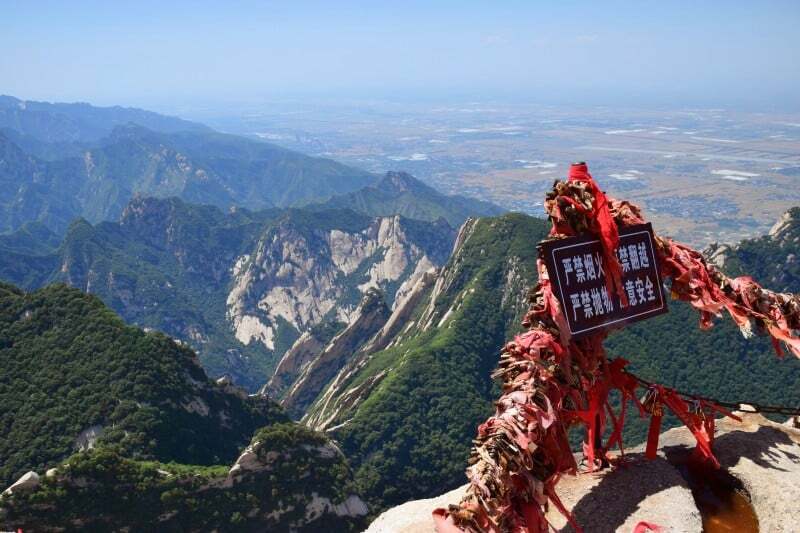 North Peak is 1,614 meters tall, offering Zhenwu Temple, Jiaogong Stone Chamber, Changchun Stone Chamber, Yunv Widnow, Yiyun Pavilion, and other spots. With a height of 2,037.8 meters, Middle Peak offers rare unknown plants, Yunv Taoist Temple, and other spots. In addition, visitors can explore Xiyue Temple originally built in 134 BC, with 120,000 square meters, Jinsuoguan Stone Arch, Canglongling with deep gullys on the both sides - one of the dangerous roads at Huashan Mountain - with 0.67m-wide stone steps and “Zigu Huashan Yitiaolu” connecting the scenic spots along the mountaineering trail at Huashanyu. Yaozi Fanshen is a steep and dangerous trail from East Peak to Xiaqi Pavilion. Visitors have to face the wall and hold the iron chain at the trail. If you are planning to visit Huashan Mountain for photography purposes, the best time to visit is during the sunrise. It is worth visiting the mountain around the year as it offers seasonal variation in appearance. Huashan Mountain is getting more and more popular among tourists. Its transportation network are developed. Therefore, there are several options. Rent a vehicle from Xi’an or Weinan. This is the quickest and most direct option. Take Bus Huayin K302/K402 (华阴K302/K402) from Xi’an Chengdong Passengers Bus Station (西安城东客运站) to the mountain. The first bus runs at 07:00 and the last bus runs at 19:15. Take Tourist Bus 1 from Xi’an Chengdong Passengers Bus Station (西安城东客运站) to the mountain. The first bus runs at 07:00 (December 1 - February 28/29) / 06:00 (March 1 - November 30) and the last bus runs at 19:15. Take a train to Huashan Train Station or Huashan North Train Station. Then, take Bus Huashan Tourists Center at the square in front of Huashan Train Station or Bus 1 or Bus 2 at square in front of Huashan North Train Station. As at 26th July 2018, from December 1 to February 28/29, entrance pricing to Huashan Mountain (including the mountain, Xiyue Temple area and Xianyu Area) is 100 CNY per person; from March 1 to November 30, entrance pricing to Huashan Mountain (including the mountain, Xiyue Temple area and Xianyu Area) is 160 CNY per person; Children under 1.2m (1.2m not included) and the elder above 65 years old (65 years old included) are free of charge; children between 1.2m (1.2m included) and 1.5m (1.5m not included) are charged 80 CNY per person from March 1 to November 30 and 50 CNY per person from December 1 to February 28/29. It is strongly recommended that visitors buy the insurance for an additional fee of 20 CNY per person. As at 26th July 2018, from March 1 to November 30, the admission fee for the Beifeng Sante (北峰三特) Cable Car is 80 CNY per person; from December 1 to February 28/29, the admission fee for the Beifeng Sante (北峰三特) Cable Car is 45 CNY per person; children between 1.2m (1.2m included) and 1.5m (1.5m not included) and the elder above 60 years old ( 60 years old included) are charged 40 CNY per person from March 1 to November 30 and 22.5 CNY per person from December 1 to February 28/29; Children under 1.2m (1.2m not included) are free of charge. As at 26th July 2018, from March 1 to November 30, the admission fee for the Xifeng Taihua (西峰太华) Cable Car is 140 CNY per person; from December 1 to February 28/29, the admission fee for the Xifeng Taihua Cable Car is 120 CNY per person; children between 1.2m (1.2m included) and 1.5m (1.5m not included) and the elder above 60 years old ( 60 years old included) are charged 70 CNY per person from March 1 to November 30 and 60 CNY per person from December 1 to February 28/29; Children under 1.2m (1.2m not included) are free of charge. As at 26th July 2018, the admission fee for the shuttle bus for Xifeng Taihua Cable Car is 40 CNY per person; children between 1.2m (1.2m included) and 1.5m (1.5m not included) are charged 20 CNY per person; Children under 1.2m (1.2m not included) are free of charge. As at 26th July 2018, the admission fee for the shuttle bus for the Beifeng Sante Cable Car is 20 CNY per person; children between 1.2m (1.2m included) and 1.5m (1.5m not included) are charged 10 CNY per person; Children under 1.2m (1.2m not included) are free of charge. Please wear soft bottom sneakers when climbing the mountain. Please take a trekking pole with you. Please focus on your steps when climbing the mountain and do not enjoy the view. If you would like to enjoy the views, please stop climbing to avoid accidents. Interested in visiting Huashan Mountain on a Tour? Wendy Wei Tours offers a variety of different packaged tours as well as custom tours including Huashan Mountain, among other attractions and destinations. To find out more, please visit our Tours page or Contact Us directly to find out more.